Temple architecture in Kerala is different from that of other regions in India. Largely dictated by the geography of the region that abounds in forests blessed with the bounties of the monsoons, the structure of the temples in Kerala is distinctive. The roofs are steep and pointed, and covered with copper sheets. 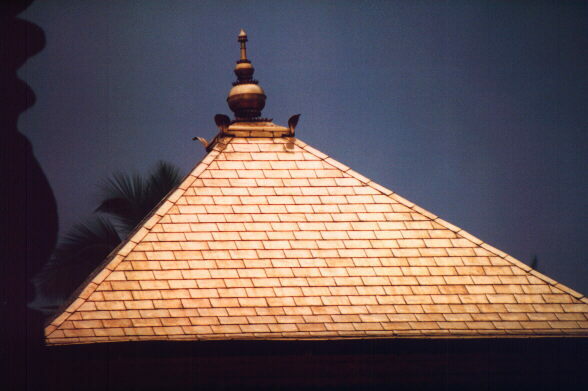 The Kerala roof resembles those found in the Himalayan regions and those in East Asia. The shape of the roof is in accordance with the plan of the sanctum below. With a circular plan, one sees a conical roof, while with a square plan the roof is pyramidal. The roof is constructed with wood and is covered with copper plates. Most of the temples seen in Kerala today, have undergone several phases of renovation, given the perishable nature of the construction materials. The central sanctum of a Keralite temple is referred to as the Sree Kovil. It is surrounded by a cloistered prakara, pierced at one or more cardinal points with a gopuradwara. The cloistered prakaram has a namaskara mandapam located directly in front of the sanctum. This prakaram also houses subsidiary shrines. A kitchen is located in the south eastern corner of ths cloistered prakaram. The mukha mandapam is integrated with the gopura entrance. The flagstaff or dwaja stambham is located outside of the dwajastambham. The balipitham may be located in the mukhamandapam or in the outer courtyard. The outer prakaram or courtyard houses other subshrines, and optionally a temple tank. The Kuttambalam or the theater hall of the Keralite temple is located either as a part of the inner prakara, on the south east corner facing north, or as a separate hall outside the innermost prakaram, either facing into the temple or facing north. This has a stage, raised from the rest of the floor, and a backstage area. This is the site of the performance of Kathakali or Chakkiyar koothu recitals. Thus the kuttambalam plays a role in educating visitors on the rich legends of the Indian cultural fabric. The Keralite temple is an amalgam of stonework, wood work, stucco work and painting - harmoniously blended into a structure vibrant with traditions of the region. The wood work here is of great importance, and it gives the essential verve and character to the Kerala temple silhouette. The inner skeletal framework of the temple is of wood, although the base and the structure above are of granite and laterite respectively. The roof projects out at several levels, in order to protect the inner skeletal framework from the vigorous monsoons that inundate the region. The Kerala temple walls are of coursed laterite stone masonry plastered in mud and lime. Murals are seen on several of these temple walls. Another distictive feature of Keralite temples is the use of vilakku maadam, or the multi-tiered brass lamps in front of temples. Lakshadeepam is a spectacular celebration of traditional lighting where tiers of small oil lamps lining the outer walls of the inner prakaram are lit. Temples have held an important place in the life of Keralites. Several temples in Kerala trace their origins to antiquity. However, they were renovated frequently and the current structures that are seen are vastly a result of the numerous renovations.